For over 50 years, Oak Tree Village has offered a place for all you folks to have fun and make treasured memories with your families year round. 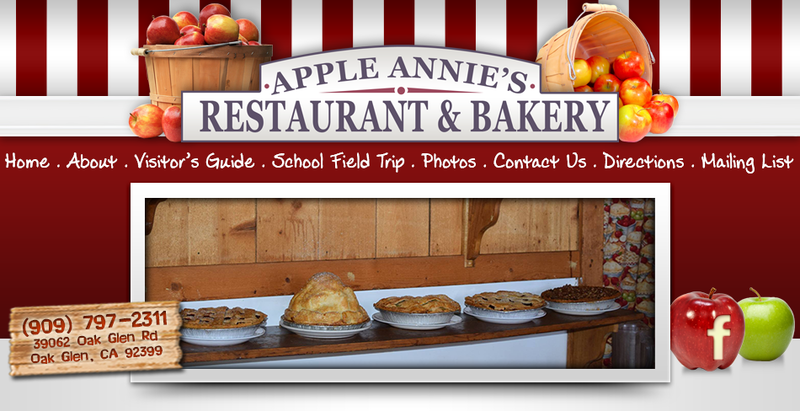 Enjoy a fresh baked 5 lb mile high apple pie and other goodies from Apple Annie's Bakery, eat a hand dipped Caramel Apple at the Village Candy Kitchen, feed the animals in the animal park and visit the local shops and artisans. Stop by the trout ponds and catch a fish. On the weekends we offer train and pony rides. You might even strike it rich in the stream panning for Gold! During the fall season visit our Apple Shed, taste mountain-fresh apples and cider, dance to foot stomp in' country music, milk a goat or even race some pigs. 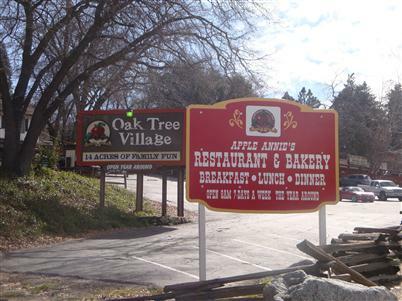 During the day have a heart-warming meal in one of the oldest restaurants in Oak Glen, Apple Annie's. Oak Tree Village, is open seven days a week 10am to 6pm. Apple Annie's is open, Mon - Thurs 9 am to 6 pm Fri 9 am - 7 pm Sat 8 am - 7 pm Sun 8 am - 6 pm.